‘n Uiters suksesvolle toerisme werkswinkel is onlangs in Beaufort-Wes gereël deur nuut-aangestelde Tourism Help Desk-beampte Amos Post. Al 64 afgevaardigdes wat dit bygewoon het, stem saam dat die program vir hulle ‘n beter begrip van toerisme en die rol daarvan in die Sentrale Karoo gegee het. “Die Tourism Help Desk is in die lewe geroep om voornemende entrepreneurs te help om klein, medium en micro besighede te begin en op te bou. Ek help met navorsing en beplanning, die skryf van besigheidsplanne en om moontlike befondsing te bekom,” sê Amos, wie deur die Departement van Toerisme opgelei is om hierdie werk te verrig. Hy sê hy gaan oor die volgende paar maande nog heelwat seminare en werkswinkels reël. A greatly successful tourism workshop was recently organised in Beaufort West by newly-appointed Tourism Help Desk officer Amos Post. All of the 64 delegates who attended agreed that the programme gave them a better understanding of tourism and its role in the Central Karoo. “The Tourism Help Desk was started to help entrepreneurs start small, medium and micro businesses and build them up. I can help with research and planning, as well as with the writing of business plans and possible acquisition of funding,” said Amos, who has been trained by the Department of Tourism to do this job. Several more seminars and workshops are in the pipeline, said Amos. A century ago a strange rumbling sound was heard followed by a great explosion in the veld south east of Beaufort West. It had the villagers of Prince Albert, Merweville, Beaufort West and many farmers in these districts in a stir. No one seemed to know what had happened nor where the noise had come from. Only a lonely shepherd on the farm Jakhalsfontein saw a flash of light and a”fireball” plummet earthwards. He was too scared to approach the spot, so raced off to report this frightful occurrence to T J Bothma, his employer. Bothma set off immediately to investigate and found portion of a huge meteorite in the veld. It was still warm and it had split on impact. The biggest piece, which weighed 360lb landed on Jakhalsfontein, where it still is. The smaller chunk, weighing 180lb, leapt over the fence and onto the farm of J S Marais. Pieces of this section were cut off and sent for analysis, display in Prince Albert and eventually to the S A Museum. Beaufort West’s Rapportryers recently placed the town’s architectural heritage under the spotlight and asked regional tourism co-ordinator Rose Willis to talk on this subject. The meeting was held in the town’s oldest building. It was built as a town house in 1832 by Pieter Daniel Jacobs, a farmer from Slangfontein. When he left the village in 1838 with a party of trekkers, the house became a stop for post coaches. The Rapportryers recently took the house over and restored it. “Beaufort West has two other houses which date back to the 1830s. Both are guest houses,” said Rose. “Matoppo was built in 1835 as a residence for Magistrate J J Meintjies and Clyde House was built in 1839 as a home for Dr James Christie, the only medical man in a radius of 200 miles. The town has many other building of historic importance, such as the jail. Despite protests from residents it was built in the middle of the main road in 1873, in keeping with Lord Charles Somerset’s ideals of having “vistas of avenues” converge on official buildings. There is a core of magnificent buildings on the corner of Donkin and Church streets. These include the Dutch Reformed Mother Church, the country’s first Town Hall (now part of the museum), the municipal buildings, the Dutch Reformed Mission Church and Barnard House (also part of the museum), Karoo Lodge (formerly the Masonic Hotel) and Pritchard House. Each is interesting in its own right and each has some spectacular features. The town also has some beautiful Victorian houses and interesting Karoo cottages. Many early travellers referred to Beaufort West as “the prettiest town in the Karoo,” in their journals. Suid-Afrikaners behoort toerisme meer menslik te maak het Anthea Rossouw, direkteur van Dreamcatcher, gesê op ‘n onlangse navorsingsbesoek aan Nelspoort. ‘n Hoofdoel van haar organisasie is die bemarking van die platteland en sy mense in die buiteland. “Die wild van ons land is ‘n skat om op trots te wees, maar besoekers wil graag mense ontmoet en net met hulle gesels. Toeriste, veral diegene wat besoek aflê in die platteland, wil graag meer leer van ons tradisies, kos, kultuur, gewoontes, geskiedenis en toekomsplanne. Nelspoort het ‘n ryk geskiedenis, vriendelike en bekwame mense en die grootste San-rotstekening gebied in die Wes-Kaap. Dis ‘n skat wat julle moet ontwikkel en bemark sodat julle toeriste kan oorreed om hier te kom oornag,” het Anthea gesê Sy was deur die Southern Cape Land Committee getaak om die gebied te besoek en die toerismepotensiaal van Nelspoort vas te stel. South Africans should ensure that tourism is more people-oriented said Anthea Rossouw, director of Dreamcatcher, during a recent visit to Nelspoort. One of the main aims of her organisation is marketing the hinterland to people abroad. “The game in this country is a treasure to be proud of, but most visitors would just like to meet the locals and chat to them. This applies particularly to tourists who visit the hinterland. Mostly they want to learn more of our traditions, food, clothes, culture, habits, history and plans for the future. Nelspoort has a rich history, friendly and capable people and the largest area of San Rock Art in the Western Cape. This is the treasure that you must develop and market so that you can encourage tourists to overnight here.” said Anthea. She was contracted to conduct a survey into the tourism potential of Nelspoort by the Southern Cape Land Committee. Strange colours on Karoo rocks have fascinated visitors for centuries. “The bright yellow, ochre and green stains, indicating uranium, in particular catch the eye,” says Nico Scholtz of the Free State University. He is studying Karoo uranium outcrops, dumps and excavations for his M Sc thesis, entitled Assessment of potential toxic influence of uranium trail mining in the Karoo. These rocks were first described in 1778 by wellknown soldier/traveller, Robert Jacob Gordon. Nico recently visited Rystkuil and Rietkuil near Beaufort West and at De Vaderlandsche Rietvalleyen in the Moordenaarskaroo, 30km north of Laingsburg, with senior lecturer Johan Loock. They took samples and scintillometer readings at the various sites, startling farm labourers with their machine that “made the rocks scream.” “Much research has been done since S A mineralogist R A Cooper found uraninite in Witwatersrand mines in 1923. In the 1930’s people in Beaufort West thought they’d found copper when they saw yellow, orange and green stains on rocks at Rietkuil. They started mining, but their efforts proved fruitless and their excavations were abandoned. They did not know that this was a uranium deposit.” Uranium in the Karoo then received scant interest for almost 40 years. “In the 1940s uranium oxide was used to create yellow and green patterns on porcelain. In May 1945 some tests were done in the wake of the Manhattan Project. Interest was sparked again in the 1970s when an American exploration company embarked on a systematic worldwide search for uranium. They selected the Karoo as a prime target because its sedimentary rock basin has a similar geology to the USA’s Colarado Plateau. Research teams from huge corporations, such as Union Carbide, moved into the Karoo and the wild enthusiasm to mine uranium hit fever pitch. The first uraniferous sandstone was found on Grootfontein, 20km west of Beaufort West, after almost a year of wide-ranging research. I am now re-evaluating the sites, taking a fresh look at uranium, how it was formed, where it occurs, how it once thrilled far-flung communities.” said Nico. ‘n Span Beaufort-Westers wat onlangs in Die Hel gekuier het, het ‘n nuwe respek vir die ou Gamkasklowers ontwikkel. “Ons het besluit om die tradisionele pad, bekend as Die Leer, uit te klim. Dit was ‘n besondere ervaring,” sê spanleier Arnold Hutchinson. “Die steil, kronkelende paadjie is deur die oorspronklike inwoners gebou om hul plaasprodukte mark toe te neem. Die klim kos konsentrasie, mooi trap en ‘n lang asem. Maar die uitsig van bo maak dit die moeite werd. Bo is daar ‘n ou donkiekraal en skuiling waar die manne kon asem skep voor hulle verder gegaan het. Die moeilikste was die afklim. Weereens moes ons versigtig kyk waar ons ons voete neersit. Die wat dit nie doen nie kan maklik ‘n hele ent op hulle agterent afseil! Die kontrei is iets besonders vol van die geskreeu van visarende, die gesag van voeltjies en die geblaf van bobbejane,” sê Arnold. Winter is hunting season in the Great Karoo, a time enjoyed by venison lovers and those who like making their own biltong. It is also a time when the greatest care is exercised by those carrying rifles in the veld. In 1906 two lads set off on the farm Stampvlei, near Victoria West, to prove their prowess as hunters. Suddenly, 13-year-old Nielsen’s rifle went off accidentally. The shot hit 18-year-old Lloyd Rivers in the shoulder. Lloyd leapt about in agony experiencing “a burning sensation around the wound.” To cool the pain he plunged fully clothed into a nearby dam. The pain subsided so he roamed about until a light breeze dried his clothes. Late that afternoon when the unsuccessful hunters returned to town Lloyd was shivering uncontrollably. His mother summoned Dr Darter. Lloyd was rushed to hospital in critical condition suffering from shock and exposure. Dr Darter removed 40 mixed shot from Lloyd’s shoulder. Lloyd then developed pleurisy and later pneumonia. “Only his youth and strong constitutions led to his full recovery,” said Dr Darter. A new Anglo-Boer War Book is in the pipeline. Entitled Vir Vryheid en Vir Reg: Anglo-Boereoorlog Gedenkboek (For Freedom and Right : Anglo Boer War Commemorative Book) this volume of Afrikaans stories has been edited by journalists Marthinus van Bart and Leopold Scholtz. The book contains the cream of hundreds of articles published in KultuurKroniek, formerly a supplement of Die Burger, known as WoonBurger. Writers include residents of old age homes and retirement villages as well as professors and other academics. This book promises to be a delightful read say the publishers. Early indigenous Karoo dwellers loved the watery flesh of an ancient, edible, potato-like bulb. When the settlers came they too learned to enjoy kambro, Fockea angustifoli. Many said the flesh of this tuber tasted like “spring water on a hot, dry, dusty day.” C Louis Leipold described kambro as “the white watery gold of the Karoo.” According to him the best way to enjoy the unique flavour of kambro was with wild fennel, bay leaf and a touch of lemon rind. In his book Polfyntjies vir die Proe he tells of a three foot long kambro, 18 inches in diameter being served to Cecil John Rhodes and other dignitaries. “About a century ago Cape gourmets could search out this delicacy on The Parade,” wrote Cape Town journalist Errieda du Toit after she visited the Karoo to search out this elusive culinary treat. “Until recently bottles of delicious “kambro konfyt” could be found at farm stalls, but these too are now just a memory.” Farmer Johannes van Wyk took Errieda on a long hike and then showed her “some insignificant, fragile-looking leaves.” He explained: “The plant’s camouflage is perfect. Only a skilled eye will find it.” He then carefully scraped away soil to reveal a cucumber-sized tuber, which he gently wiggled out of its rocky bed. Errieda liked the taste of this ancient titbit. “Its subtle tart after taste set my culinary mind racing,” she said. Note: Kambro, like most South African wild plants is protected by law. No person may dig out, pull up, pick, destroy or spoil any wild plant in this country. Beaufort West theatregoers excitedly anticipated the arrival of “The Great Nelson Jackson” early in 1906. “He comes here fresh from 18 months at the Palace Theatre, a banquet at the London Owl Club and a three-night run in Cape Town. Performances at every venue were booked out,” reported The Courier of March 26. “Beaufort West always welcomes artists of this calibre. We must receive him in such a way that he will not hesitate to include our town in any future country programme he arranges in South Africa.” Jackson kept the audience spellbound with his rendition of Mandalay. “Rudyard Kipling has many exponents of his wonderful poems, but never has such justice been done to them. 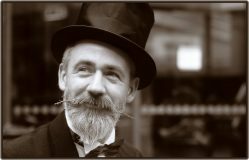 We compliment local impresario Mr Winterbottom, for bringing a performer of such high quality to town,” wrote The Courier reporter.